Getting started with and, more importantly, sticking to a coach to 5k regime might be not as easy as some professional guides indicate. What beginners usually say is that running quickly gets boring or takes up too much time. The more experienced athletes, on the other hand, might reach a physical and sometimes mental plateau in cardio training and running. However, we know that running is crucial in training for a good obstacle race result (OCR is purely a runner’s game) so you can’t just skip cardio workouts when preparing for a race. That’s why we’re here to suggest some tweaks to your cardio training. These have helped us overcome those plateaus and they’ve also kept the beginners on the team interested when motivation was hard to get by. This is the never-boring workout to up your cardio training and endurance. We find that what works best is not to just the exercises that have become boring and stale, but to instead throw someting unexpected into the mix. For example, if you’ve been running 5k a couple of times a week and you’re not seeing improvement, you could change your approach with our suggestions below to create a totally different mini-circuit training session. The split is super simple. Instead of running for a long stretch of time, run at a fast pace for just 1k. Follow this up immediately (you don’t want to take long breaks in between) with a 1k weighted brisk walk. To add weight, you can use a weighted vest, a steelbell a.k.a. 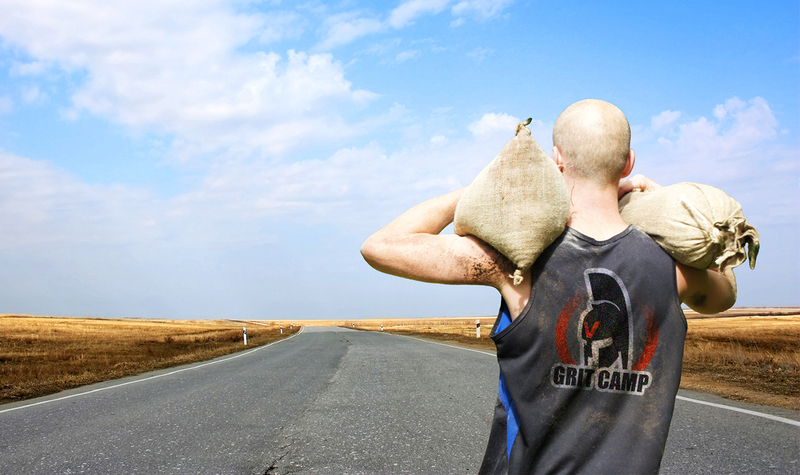 the ‘Spartan pancake’, a sandbag or the DIY cheap solution – kettlebell in a backpack. After the walk you should repeat the whole circuit for at least 5k. Because of complicated logistics (with the extra equipment involved), you might prefer to complete this circuit indoors, on a treadmill. Alternatively, you can calculate the distance so that your first run is 500m out and 500m running back to the spot where you started from and where you can pick up your weight for the second part of the circuit. Because of the added variety you might find yourself going further than you would have if you ran a 5k in one go. You can also make yourself go further by doing this mini circuit weekly, and adding another new set every time. This way of training aligns well with real race scenarios where you run from one obstacle to the next, and in between you do strength-based activities. Additionally, carrying the heavy weight week on week could help you adapt to some typical obstacles, such as the sandbag carry. Trying out the different movements that strain your body in new ways also helps to bring you closer to being an ‘all-rounded athlete’. The next time you’re just ‘running’ after you’ve been doing this mini circuit, you might find that your endurance has increased and you are able to push yourself further. Likewise, you might also reduce your time. This is all thanks to your heart rate staying elevated during the circuit for an extended amount of time, and to the physical strain involving strength. In no time, you can find your plateaued 5k becoming a 6k, then 7k, and so on. And now over to you. How do you stay motivated and overcome plateaus? What would you recommend to the OCR beginners wanting to build up training habits? Share your thoughts below.